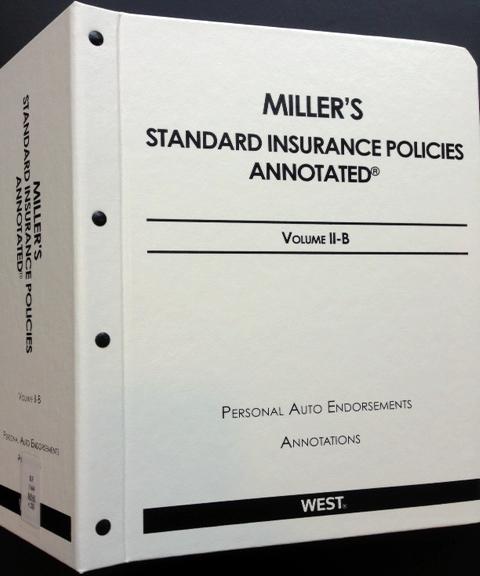 With over 187,000 annotations to state and federal cases decided since 1978, Miller's Standard Insurance Policies Annotated is a treasure trove of American standard property and liability insurance policy interpretations. This reference treatise also features over 1,000 endorsements, reported court decisions interpreting nonstandard policy language, and many forms reprinted with the permission of the Insurance Service Office, Inc. (ISO). Each annotation notes the prevailing party, jurisdiction, and decision date to help the reader quickly identify on point case law. There are a few different ways to locate information using Volume 1 Locator of Forms and Annotations. For a specific form - whether it is a policy, endorsement, or specific coverage provision - the Locator index lists forms alphabetically by form abbreviation. Check the Supplement Annotations Locator for recent updates. Without a specific provision in mind use Miller’s Index to find forms and sections related to a particular topic, word, phrase, or coverage provision. This index is particularly helpful for finding information that uses a similar but different term, such as "family member" versus "relative."